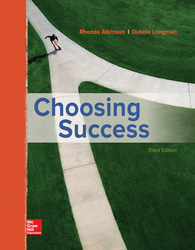 Choosing Success focuses on how good decision-making skills determine success in all aspects of life. From study skills to money management, Choosing Success applies active and service learning techniques as well as the 5C decision-making model to prepare students for success. Module 11.1: What Is Stress?